Instructions for making and using writing tablets. 35 Minimus support sheets, including plays, songs and suggestions. Contact Barbara for more information. 'Auricoma', with translation. Video clip may yet appear! Article by one of Minimus' greatest supporters in the US describing her activities with the course. 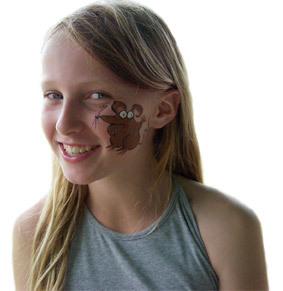 Or you could always walk around with Minimus on your face! All resources on these pages were provided by teachers and friends of Minimus. Please use them freely, but remember to credit the author. If you have an exercise, game, lesson plan or article you'd like to share with other Minimus users, please contact Barbara or Helen. Minimus website created and maintained by Helen Forte, illustrator of the Minimus books.